Chinchillas have dense fur. Over time, oils and moisture collect in the fur. In the wild, chinchillas have no way to clean their fur other than to roll around in volcanic ash which acts as an absorbent. Chinchillas do not go into water. Nor should you ever bathe your chinchilla in water. Doing so would remove the natural oils which protect a chinchilla's skin and helps them regulate their body temperature. Instead, it is best to give them a bowl or container filled with “special” dust for them to roll around in. The frequency of such bathings will depend on the climate you live in. Chinchillas in a dry climate will require fewer dust baths than a chinchilla in a humid climate. The dust bath should be left with the chinchillas for around 20-30 minutes. More often than not, they'll stop using it before the time is up. You'll also want to watch out for dry, flaky skin on your chinchilla. If you see signs of this, consider increasing the time between dust baths. If you enjoy watching your chinchillas roll around in the dust like we do, consider buying a glass container for them to use. Plastic will get scratched over time impairing your view. Make sure the glass is strong and securely held in place. The last thing you want to have is your chinchilla rolling around in broken glass. Finally, the dust bath shouldn't be kept in the cage because it maybe end up being used as a litter box. Also, there's a chance that the constant exposure to the dust will cause inflammation or infection to your chinchillas eyes or eyelids (conjunctivitis). I don't have any dust for my chin, and it will take 8 days for my blue cloud to ship in. Could I use normal ash for now? My chinchilla is 3years old and about 2 weeks ago i got a 2 chinchilla also a male like mine... But since then my chincilla started to pee on himself and i dont know what to do about it or how to clean him now. I desided to let the new chinchilla go and live with my son. Please help me ? I dont want my chinchilla to get sick..
My chinchilla decided he was going to have a bath in the coal bucket is this bad for him ???? No balls for chins! They don't sweat and overhear very easily! If he over beats can get beat stroke an die suddenly. They call them death balls for chins. Please do. It use the. All with your chin! This response is a good one I just want to correct spelling & whatnot from their autocorrect. “No balls for chins! They don’t sweat and overheat very easily! If he overheats he can get heat stroke and die suddenly. They call them death balls for chins. Please don’t use the ball with your chin! Is there any way of making your own dust bath for your chins? I have one that is 6 and she is fussy but I love her! Hi, I have noticed that my chin has been having damp fur under his eyes but not other signs of wet eyes or anything like that except sometimes he opens his mouth really wide but I have checked his teeth and they look perfectly fine, and when I let him out to play hes still really hyper. So I am just wondering what could be the cause of the damp fur under his eyes? I forgot to buy dust bath is there anything I could use instead????? My young son mixed our chinchillas food and the bath dust then fed it to her. Is this bad? I'm make a home made cage. is it possible to attach the dust bath to the side of the cage and take it off when they are not using it? I don't see why not as long as you're not permanently leaving it in there. Just make sure its stable when you do put it in their.. My two chins share a cage, and their dust is in just a big tuperware bowl, and sometimes when I don't have time to give them run time but I want to make sure they get their baths I just put the bowl in there for a little bit but always remember to take it out once they're done so they don't use it as a littlebox! Hope this helps! :) Good luck! I just got two chinchillas from a family on ksl.com, and they didn't tell me how many times should I give my chinchillas a dustbath? Once a day? Once a week? A chinchilla can bathe anywhere from once a week to once a day.. Just put the bath in his cage for about 10-15 minutes and let them do their thing! Do not leve it in there permanantly, they'll go to the bathroom in it! I give my two boys a little free run time about everyother day and I put the bath out for them. I have two baby chinchillas and I was wondering how old do they have to be? And how do I teach them? No, you do not have to teach a chinchilla. Dust baths are natural instinct to them and as long as the dust is visible they will start bathing! My Chin will pee on his shelves then lay in it getting his fur wet, rough, and smelly. I took him to his vet who told me to get him a little wet to wash off the pee cause my chinchilla was pulling at his fur in that area. so now when he lays in his pee I get him a little wet to wash it off dry him as well as i can with a towel and then brush his fur out. but that pee smell still lingers. what can i do to get my Chin smelling better. cause he likes to cuddle but he stinks. Help my smelly Chinchilla! if you take care of them properly, up to 20 years! I have just recently aquired an Adult Chin (dont know the age), from what I understand the Chin use to be a school pet and then this other family got it because the class could no longer take care of it. Well since the family got the chin, they got a big dog that would bark all the time, so I guess what Im trying to say is the Chin was not taken care of properly (from what I have read). The Dust was left in her cage all the time and she started to use it as a litter box and somewhere to go when it got scared. I have taken the dust out of the cage gave the chinchilla something else to sleep in or hide in, it seem OK with that but I saw it rolling in it's litter box. Thought I would offer the bath but he/ she went into the container pooped and sat there. What should I do? Obviousely, it was not sociaized well and bark when I or my children (12, 10 yrs) try to pet it. Im assume I need to socialize it, but dont know how to go about it. This poor thing even has a wire floor to walk on. I guess I just need some advise all round, can anyone HELP, Please!!! I want to give it a good home with us and would love to be able to play with it without it getting scared. a wire floor is a BIG no! It hurts his lil feet! I would get him a now cage that has a pan in the bottom so cleaning is easier. I have a ferret nation, but other cages are ok too, just make sure that it doesnt have plastic in it, they will chew it up and it is very bad for them and can be fatal. If you cant buy a new cage, buy a large enough peice of wood to put on the bottom of the cage & make sure it covers the entire floor buy white wood and sand it down, do not buy cedar it has toxins in it that will kill him. How long ago did u get him? Usually when you bring a chinchilla into a new environment it is good to leave him be to check out his new home for about 2 days. Chins do not like loud noices and it does seem like he has been very neglected, how sad :( I would hold up on petting him for a lil while, sometimes it takes a couple of weeks for him to get used to his new owners, especially since he seems really afraid. The best way to help him be more sociable is to sit next to his cage and talk to him dont try to pet him, just talk to him. It will take a while be4 he will let you handle him. When u do pet him, be very gentle and try not to startle him. Does he have any levels to jump up on? Or is the only surface, the wire? You can go to petworld or a pet store and buy some wood shelves for him to jump up onto, he will like that. About the dust bath, do not leave it in his cage. Give him a bath 2-3 times a week and when you do put it in for 15 min and then take it out, otherwise he will use it has a litterbox. When you say he was rolling in his litter box, does he only go in it? I havent heard of potty training a chinchilla? I would take out the litter box. You know not to feed him fruits and veggies right? And if u feed him treats no raisins, feed him a plain unfrosted cherrio. Feed treats sparingly or it will give him diarriha. Do you have any other concerns or questions? Oh and i also forgot to tell you. Another good way to relieve stress is letting him run around in a chinchilla proof bathroom. Make sure there is nothing he can chew on and that it is safe for him. Do not leave him in there alone! Sit in the bathroom with him, just sit there and he will come up to you and sometimes even just up on ur lap after hes done exploring. dont frighten him and try not to chase after him. I have a female chinchilla and the fur under her neck and down her chest is matted and crunchy. The dst bath doesn't seem to help. What can I do to clean her up?? get a flea comb from ur local pet store and brush her fur out. its great bonding time and they like the way it feels. April, I would get that chinchilla to a vet who specializes in exotics, and have them check her teeth. That matting may be the result of drooling, caused by malocclusion, which is a tooth deformity. Unfortunately, malocclusion is a very serious condition, and can even result in the chinchilla starving. You just have to wait a couple of days to give her a dust bath. She will love it too. Just leave it in her cage til she's done or ten or fifteen minutes ( some chinchillas will stay in it forever if you let them) then take it out of her cage, this is purely to stop infection. The dust that she kicks and is okay to be left and she'll probably use that as well as she can until her next dust bath which is fine. Enough to pick up to put her in a play area. I also bought her some chiin save treats. Thnks again for ur help. I have a girl chinchilla and I wanted to know how often do you have to wait to dust bath them? A week or a couple days? it changes due to where you live, humidity, and season. for example i live in florida, in the winter i would only have to dust her about 2 times a week. in the summer when it is more humid i would dust her 2-3 times a week. you can do what megan said and let her have the dust bath in her cage, or you can let her have them durring play time, its a personal choice. Hi, I have 7 chinchillas and have used many kinds of dust. I had been using the vanilla dust because it has a more sandy feel then powder and does not leave a residue everywhere like the powder kind. I also use the bath house and the powder kind still gets everywhere and makes a big mess. It also stays on the chinchillas for a long time after and continues to fly around. My son has allergies and until I started using the vanilla dust it made him sneeze. I have been trying to find it in the stores and they don't carry it anymore so I am online looking for it. I love it and so do my chins. a sandy feel is not good. that means the particles are bigger and will not penetrate the fur. i have heard nothing but bad things about that dust. first the scent is bad for you chinchilla, it will cause resperatory problems. and it doesnt do very well. go to petsmart and get blue cloud dust or you can buy it online and get more for a cheaper price. it is the best kind of dust out there. its what all good quality breeders use and what people use when their chinchillas go to shows. (like dog shows). another thing: when you have a chinchilla, theres going to be dust every where, theres nothing you can do about it. if you cant handle it you should not have it. how much dust should i put in the bowl? How often do i give him a dust bath? Should i set it in his cage (will he go in it by himself, or should i show it to him?) or should i set it on the bathroom floor when im letting him run around in the bathroom? Give a dust bath 2 to 3 times a week. You can set it in his cage and he should go in it (it's the natural thing to do) but we have had one chinchilla and I don't know why ususally they enjoy their dust baths but she went on bath strike. When she did this we just had to get some dust on our hands and rub it on her and then we would put her in her bath we only had to do this a couple of times and she was back doing it on her own. You could also set it on the floor and let him use it in the bathroom. I just got 3 chinchillas and the girl just had a baby, how long until the baby can dust bathe? How much dust should be put in? it doesnt really matter, just put maybe a little under an inch in you container, just so the chinchilla will get enough. Put about 2 inches on the bottom so that the chinchilla can bathe properly and get into the dust. its not really special dust its volcanic ash which i know sound crazy but its true!! Is there anything else you can use for dust baths instead of the "special" dust? they can live up to be 20 years old! i know pretty long time! One of my 2 8-mos old chinchilla females (littermates) died by getting caught in a hammock tie, and then, I guess, having heart failure while thrashing about. I'm planning to get another chinchilla because our remaining one seems very depressed. Anybody have any experience with this kind of misfortune? You may want to see a vet for that kind of thing. Or she may want you to give her dryer lining in her cage. you may also want to try taking it to a vet.There might be something wrong. what kind of dust should you use for the dust bath, and were would you get it? You can buy "special" chinchilla dust at any pet store. I live in TN, How often should i give my chinchilla a dust bath??? i live in TN and i give them dust baths 3 times a week and it seems content with that..
You should never wash your chinchilla with water! I forget the specifics but it deprives them of the essential oils in their fur, which is very dense and designed by nature to fight off parasites and keeps them warm. (source Animal Planet: Chinchillas) Just used the "Dust Bath" you can purchase at pet stores which is really just very fine volcanic rock. DO NOT use regular sand! 1.do i put it in his cage and wait for him to go inside...or leave it outside the cage pick him up and put him in? 2.wehere do i get the dust bath sand?? 1.Yes you should leave the dust in the cage and wait for him to go inside. Picking him up and putting him in would be bad because he could inhale some of the dust unprepared. 2. My family buys dust at Petsmart. Most pet stores carry it. The dust is most likly were shavings are. Wait, I thought that you weren't supposed to leave the dust bath container in the cage because too much exposure to it is bad for the chinchilla...I don't know - I'm new to all this. wait jessica did you give it a bath in water? What brand of bathing dust is the best? Has anyone been able to tell a difference? How long does a 5lb bag last for 1 Chinch? Thanks. well i never read that u were not supossed 2 give chinchillas baths and i did so if u do will they get sick too and will they b unsble 2 protect their skin eaither?? Jessica - giving a chinchilla a bath in water messes up it's natural oils. IDK about it getting sick, but I will often lead to self mutilation. IDK how old these posts are (I'm not seeing any dates), but if your is recent, you DO need to take your chinchilla to the vet. As far as the temp, under 78F is ideal, over 80F could be lethal. The chinchilla fur is very dense, and will no allow the water to.escape from your Chins fur, mold will grow and It will itch. Your chinchilla will mutilate itself. Dry it immediately. Dust bathes only. Keep the room which you have your chinchilla in cool. I keep Octavia in my room, which I keep from 65-70. Cooling pads are available online as well. Your chinchilla might be depressed, are you letting it out in a good environment for at least an hour a day for exercise? Also does it have things in the cage to nibble on, hay, pellets, Apple wood sticks, and non colored lava rocks keep Octavia happy. Pay attention to the fecile matter, it should be brown, small, and dry, anything else and you may need to go to a vet immediately. Hope something helps. Truefully it dosen't matter you could go bi sand and it would work and if and a 5lb bag is huge if u fill your container about an inch full it should be fine. Replace the sand after 2-3 times. ok so this is my second chinchilla...the one that i had before was reallllly old and only had 2more years on its life (sad..but in that time i learned how to take care of a chinchilla) but the one i just got is like not even a year old and its old owners never fed it fruits and vegies and never gave it a dust bath! so how do i get it to start to eat the treats i am leaving for it and to take its bath? i mean it wont even go near the fruit and it starts freaking out any time i try putting it in the bath! do you think that maybe until it gets used to the bath instead of using the bath house i should use some kind of open bucket so he isnt so worried? Do not put ur chinchilla into the dust bath, he will go into it himself, but the dust bath in and leave it in there for 15 min, puttin him in there could make him unexpectedly inhale the dust. And feeding a chinchilla fruits and veggies are a big NO NO! Only feed ur chinchilla treats 1-2 a week max. Feeding them fatty treats is fatal and they can die from a fatty liver :( Rasins are not good either. Good treats are plain non frosted cherrios or rose chips. i would give them a couple days to settle in. when i got my chinchilla he was 3 months old, at first he didn't want to go into his dust bathhouse, i put a little of the dust on y finger and just let his get used to it (it sounds weird but he loves it now and a has a bath every day), just give them time to investigate on there own but if he is going near it don't try to touch him or talk because it may scare him, just let him figure it out! Hello, I have been an owner of a chinchilla for a couple of days. I attempted to give it its first dust bath. All it did was just sit there. Is this normal? I got my first Chinchilla a few months ago. Followed by three more a month later, and one more just recently. For the most part, all of the chinchillas sat in the dust, one even fell asleep in it! We tried different methods.. one was putting them head first into the bowl, (not such a good idea.) Another method we tried was sprinkling the dust on them. The chinchillas would put up such a fuss that the dust would blow everywhere. You know what happened after that? About 15mins or so later, the chinchillas would notice the dust on the ground, scratch it and start rolling on the ground. Goofballs. But my boyfriend figured the best way to give a chinchilla a bath is to put the dust bowl in its play area, step back and let them get accustomed to it. Rolling around in the bath is natural to them, so don't worry about having to show them how to do it. hi! it is very normal but don,t worry just pour some bathing sand right befor you give it a bath! GOOD LUCK WITH YOUR NEW CRITTER! Hello like can i use sand from the beach as that dusy cuase i live in kuwait and they don't sell it!! 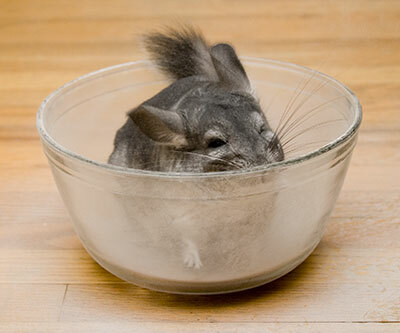 It is volcanic ash that chinchilla's roll around in not sand. Sand is much corser than the ash. I don't think it'll necessarily due him harm but it won't help for what he needs. See if you can order some online. You can reuse it. Get a sieve of some sort and when the chinch is done taking his bath run the ash through the sieve and it'll filter out anything but the ash. I just adopted a chinchilla from an owner that seemed to neglect him. He chews his hair. He was living in less than decent living conditions. His house was only one level, full of plastic parts, with nothing to play with or chew on. He was also living in his dust bath house. I have gotten him a 3 story metal/wood house full of toys. I hope he will stop chewing his hair. Though I find I CAN NOT get him to take a dust bath. I have tried offering him treats (which he refuses). I have tried changing his dust, and I have tried rubbing the dust on him, this really seems to make him mad. Is there anything I can do to get him to start taking baths. I have yet to get him a wheel. The all metal ones are pretty expensive, though I will do that soon. I hope this will give him an outlet so he is no longer board/anxious/ or stressed. Is there anything elce you reccomend for an abused chinchilla to start to trust and play again. Just give him lots of time. Rub a bit of the dust on him, like you're doing and he'll get used to it. Chinches love papaya and other fruit but only like once a week as it can cause them stomach distress if given too much. If you can let him into a room and WATCH him, it'll help distress him. He needs to be watched as stressed chinchillas chew everything. He can run around, then when your done, coax him back to his cage. Does he have a hiding place. Get a cardboard box and cut ONE small opening, so he can go in and turn around. That way he can have all his body protected and just stick his face out. This will be his safe palce. Usually chinches will eventually chew the box, so you'll need to make one more than once. Give him chinchilla approved wood to chew on. If you can borrow another chinchilla put that chinchilla in a dust bath and let the stressed on watch what he's doing. DO NOT put them together. Keep them seperated by the cage. Only allow the stressed one to watch the other take a dust bath. my chinchilla loves to sleep in her dust bathe. is this bad for her? I was wondering why my baby chinchilla is not rolling in his dust bath i just got him about a week ago and he doesnt want to take a bath he just always on the go should i try to hold him there and rub the dust on him??? I just want to thank you for your help. I returned my scented dust yesterday (even though it was open) and got regular dust and my chinchilla rolled in it within 5 minutes. I do have another odd question, is it normal for a chinchilla to sit at the side of the cage and just stare at you? My chinchilla will watch me for hours if I stayed in one spot. yes that is normal, i have two chinchillas and just adopted them not too long ago and learned awefully alot about them and how they are and so far they love to watch me all the time just sitting there in the corner and watching me for hours on end and i love it!! even when i am in the kitchen they can see me and just watch me and thats what i seem to think is cute and i talk while they watch me at the same time and they know that i am speeking to them!! so yes i think its normal mine do the same all the time!! how often should you give your chinchilla a dust bath? Blue Sparkle dust bath is a favorite of chinchilla owners. If that's not available, try something unscented. You may be able to get a small box of dust from your pet store which would be a good to test to see if your chinchilla will roll around in it. What would be a good dust to buy? yes that is normal, i have two chinchillas and just adopted them not too long ago and learned awefully alot about them and how they are and so far they love to watch me all the time just sitting there in the corner and watching me for hours on end and i love it!! even when i am in the kitchen they can see me and just watch me and thats what i seem to think is cute and i talk while they watch me at the same time and they know that i am speeking to them!! so yes i think its normal mine do the same all the time!! and blue cloud dust seems to be the best as far as i know and they love it!! its fun to watch them roll in it but the mess afterwards is not fun but its worth the time to watch them bathe!!! I have a scented one, which might be the problem. But it is a fine dust and the container is a rubbermaid container that is about the size of a shoe box. I know he can get into it because he will sit in it but he wont roll. I was holding him today and he had poop stuck to his fur. I took them off and rubbed some dust on him to see if that would help but now he seems scared so I am afraid that I scarred him emotionally (or something to that effect). That's a new one. We've never heard of a chinchilla not rolling in the dust. What kind of dust are you using? Is it very fine or coarse? Are you using a container for the dust? Maybe getting into the container is confusing. I bought my chinchilla about a week and a half ago and I can't get him to roll in his dust. Any thoughts? Chinchillas will use their dust bath when they want to. Try again in a few days. I just recently bought a chinchilla (today) and I tried putting it in the dust bath for about 10 min and he didn't do anything...should I be worried? doesnt seem to like it. i cant find any of the dust that he likes. 2. is it normal for them to scratch themselves? 1. How soon before your last bath did you offer it? 2. It depends on the amount, it it's too much it could be due to dry skin. A little Is normal. Take dogs and cats for instance, they scratch sometimes, it doesn't always mean something. But if they are pulling tuff's of fur out that us a cause for concern. i do not leave the dust bath in the cage i just leave it in the bathroom with me there for 15 mins and let them do there roll around and great to watch and it creates alot of dust when they roll and can leave a mess as well to clean up?? that is why i do it in the bathroom because its easy to clean up afterwards!! Check local classifieds online. There is no single source free/inexpensive chinchillas that I know of. i am just doing research on chinchillas because i am hoping to get one, any idea where i could get one for a somewhat cheap price or maybe even free? Other pets can stress out chinchillas. They can also be a danger to them if they're not kept in separate areas. Do not fool yourself in to thinking that you will be able to react fast enough should a dog or cat attack your chinchilla. However, we know of people who have had no problems having multiple pets because they're careful. As for the chinchilla in the picture, that's one of ours! A fishbowl should work fine. The glass is pretty thick and shouldn't break just by tipping over. Keep it on the ground or in the cage rather than on a table so that it can't fall. Also, there are certainly some cheap fishbowls, so just make sure you get a solid feeling one. Oops, I have one last thing to ask! I love watching the chinchillas at work take a dust bath. I think it's the sweetest thing ever. You've suggested getting a clear glass container to watch them, but at work we just have this red see through plastic house thing. What can you recommend to use? My manager said to use a fish bowl but what if the chinchilla can't get out because its too tall and by trying to get out it could tip and break? Also, what is a good thick glass to use. I was thinking Pyrex or something, but is a bowl sufficient? Hey, I'm just reading everything I can about chinchillas and thought I would comment. I work at a pet store, and my manager is a chinchilla-crazy person. At one point she had 7 and now she has 4. I've asked her because the new apartment I'm moving to doesn't allow cats, dogs or bunnies due to allergies. I read that people may not be allergic to chinchillas but rather to the dust. Both my boyfriend and I are allergic to dust, him more then I. My manager uses this vanilla bean dust. Her friend is allergic to dust and finds that regular bathing dust makes her allergies flare up, but the vanilla bean dust doesn't. I've never smelled or used the vanilla bean, but I asked if that's OK because its scented. She said that the scent isn't strong, but that it is noticeable. I think when I do get my chinchilla, I might look into the vanilla bean dust, but I'm sure there is something on the label that would say if the scent is safe or unsafe for chinchillas. The good thing about dust is that it's not ingested so you can try different kinds without likely causing harm to your chinchilla. What you want to look for is dust that doesn't irritate your chinchilla's eyes, keeps the fur healthy looking an not matted, and doesn't bother you i.e. allergies. We prefer to use the very fine powder type, but we don't know the brand as it comes from a breeder we trust. We'd stay away from the new dust that have appealing smells. What do you think is the best dust? I am currently using the Kaytee brand. We would stay away from scented dust baths. Stick to the high quality dust that is good for your chinchilla. Your nose shouldn't play a part in the decision. As an aside, chinchillas shouldn't really have a detectible smell. I was recently at the pet store and they were promoting a dust bath that was vanilla bean scented. Is this safe for my chinchilla? The dust smells really good, but I wouldn't want it to irritate my baby!